There are nearly 400 routes to climb in Paklenica suitable for everyone from beginners to seasoned climbers. The most famous is the 350m-high cliff face known as Anica kuk. The mild climate allows climbing year-round on the rocky range framing Baska beach. The wall of mountains between Baska Voda to Mt Biokovo behind Makarska offers 200m to 400m routes. The southern cliffs attract climbers every April for the Marjan Cup. 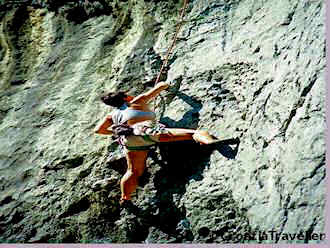 It's easy to get a foothold (sorry) on Marjan by taking an organized four-hour rock climbing tour with an instructor. All equipment is furnished and the tour is suitable for all levels, even beginners. More info. The variety of routes makes it suitable for beginners and the sea views are stunning.